One of the things that was a constant for the years that Sam Waterston was a regular there was his lapsed Catholicism. He made no secret that he repudiated what he learned in parochial school and he seemed to really enjoy going after religious hustlers. Now he has a case that truly challenges his own non-beliefs. A young hyperactive adolescent is brought to a hospital by Mel Rodriguez and she dies while in the waiting area of the emergency room and Rodriguez who is a retarded individual books. When Rodriguez is located the trail leads to Frances Conroy who many consider an urban saint. She is a drop out from a convent, preferring to do things her way. What she was doing was conducting an unauthorized exorcism and the child died as a result of the injuries. Conroy goes on trial for criminally negligent homicide and the picture that is brought out by her lawyer Wendell Pierce is a selflessly dedicated woman who takes no money for her services, such a contrast to all those pompadoured reverends shamelessly asking for coin on every broadcast. I even wondered how she paid her rent. Like Joan Of Arc she hears voices, like the Maid of Orleans the specific voice of St. Michael. 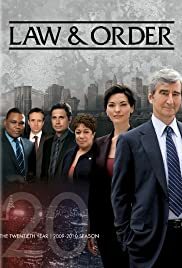 Waterston never crossexamined a defendant like her before or after in his tenure with the show. It reminded me of Michael Clarke Duncan's character in The Green Mile, a simple selfless soul with great gifts. Somewhere in the human community you like to think there are such as these. If Waterston felt like the Bishop of Cauchon after it was all over you could hardly blame him.